A bold hardware mix. How much power does the Radeon HD 7970M still have when the high-end graphics is combined with a weak processor? MSI installs AMD's low-cost A10-4600M quad-core in its GX60 to achieve the lowest price possible. Our benchmarks reveal the sobering results. 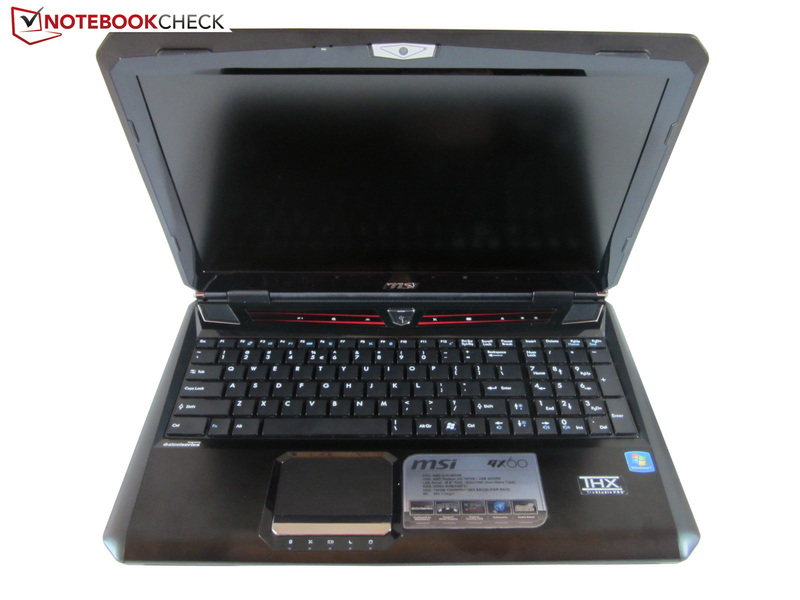 The gaming giant MSI is particularly known for its attractively priced multimedia laptops (GE60 & GE70) and its powerful high-end machines (GT60 & GT70). It can be said that the GX60 released in late 2012 is an intermediary model. 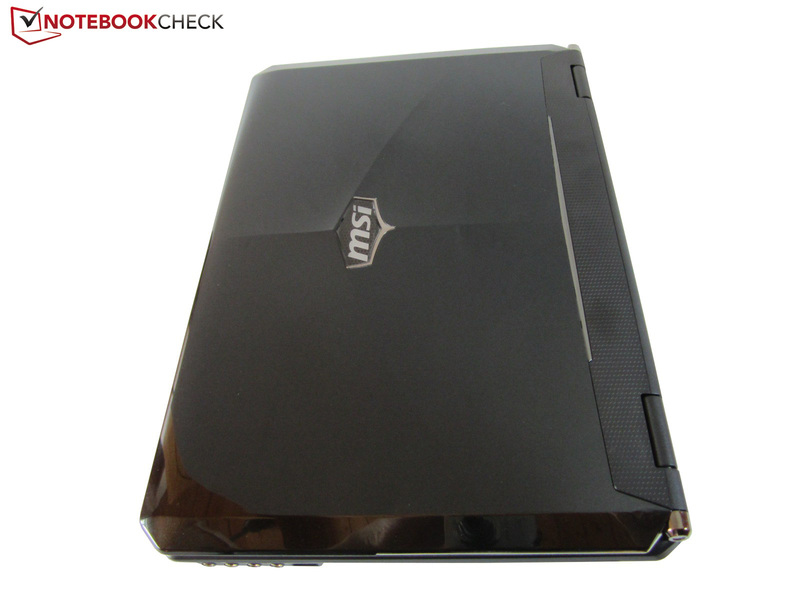 The 15-incher promises a lot of gaming power with the Radeon HD 7970M installed in it. At least on paper. The 2.3 to 3.3 GHz frequency of the Trinity CPU does not exactly translate into good performance figures. 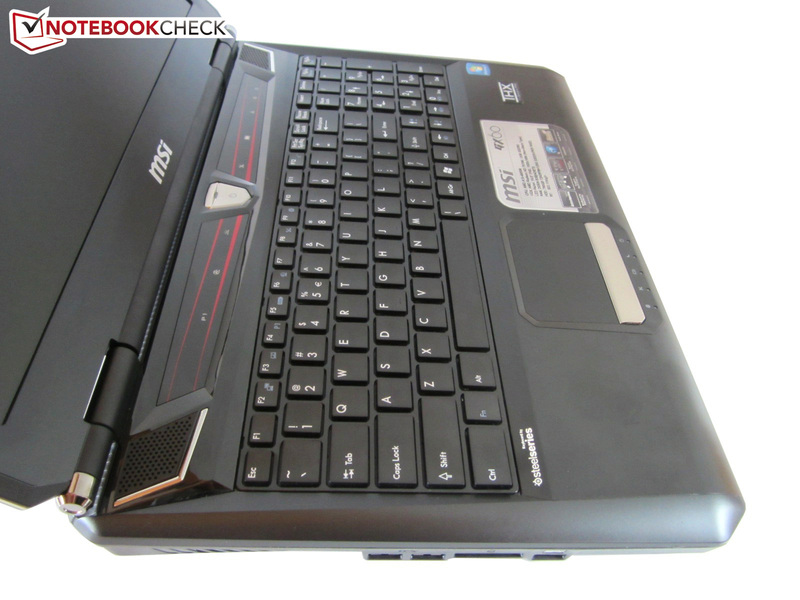 No wonder that the A10-4600M has only been used in entry-level and midrange laptops until now. Most manufacturers rely on the efficient Ivy Bridge generation from Intel for their gaming products. We checked whether the quad-core's performance noticeably decreases using diverse benchmarks. The other equipment in the GX60 is very impressive. The US model AC1-013TW we were provided with features two small 64 GB mSATA SSDs that work together in a RAID 0 mode, in contrast to the German A10797287B counterpart (~EUR 1200/$1600). A 750 GB HDD from Western Digital is installed as the secondary hard disk. The models are otherwise largely identical. A 4 GB DDR3 RAM module is in both working memory banks. Matching the Full-HD screen, the manufacturer also installs a Blu-Ray combo drive (burns CDs & DVDs). 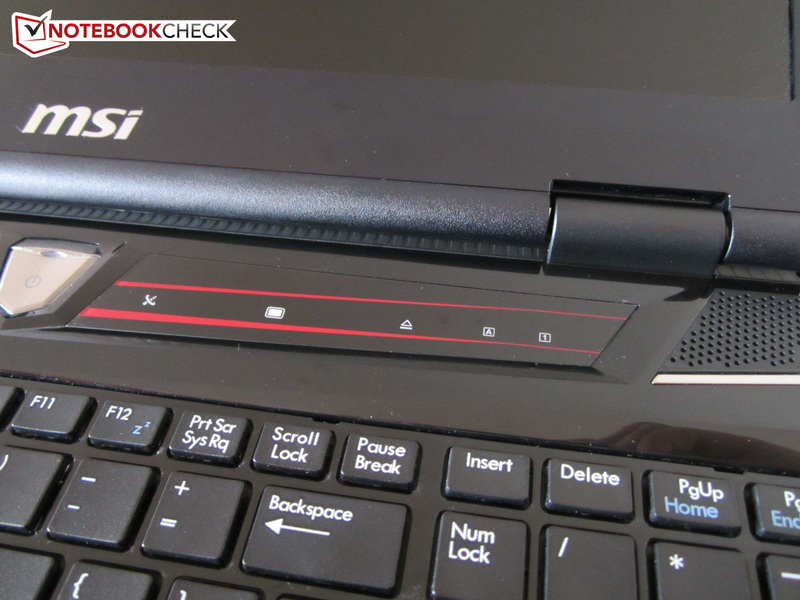 MSI opted for Windows 8 64 bit as the operating system of choice. The Taiwanese company continues to use flashy gamer looks although the current design trend is going toward elegance and simplicity. While the metal wrist rest makes a fairly high-end impression, the other surfaces look quite cheap. Glossy plastic elements might look chic on press pictures, but their high smudge susceptibility soon becomes annoying in practice. Fingerprints and dust particles accumulate on the display bezel, the keyboard area and the useful function bar. However, the biggest shortcoming is the sensitive lid that clearly affects the quality impression. We would have appreciated a matte, aluminum finish like that on the more expensive GT60 model. If you generally like it less obtrusive, you should prefer Clevo's W350ET barebone (Schenker XMG A522) or the P150EM (Schenker XMG P502). The GX 60 has to also accept criticism for its large size. 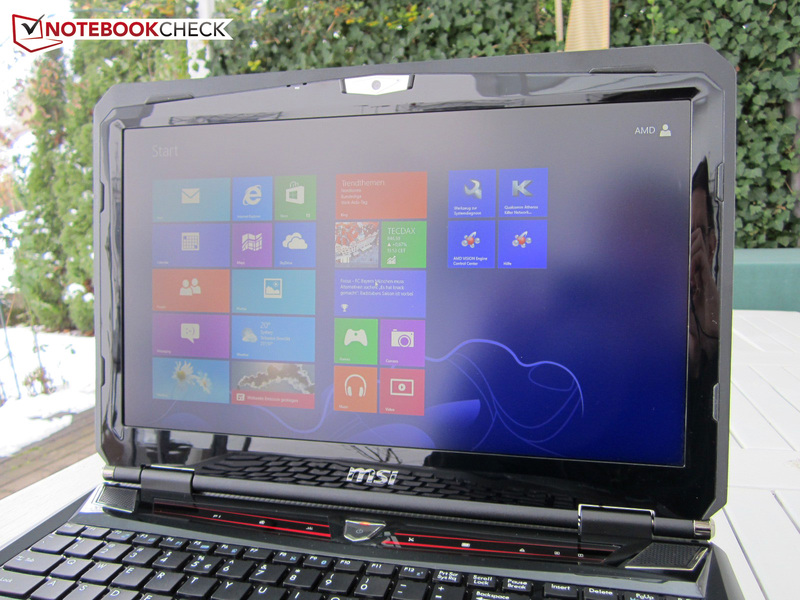 The gaming laptop towers over most of the 15-inch competition with dimensions of 395 x 267 x 55 millimeters. For example, the previously mentioned Schenker XMG P502 has a size of 376 x 255 x 51 millimeters “only”. The GX60 also weighs more (3.4 vs. 3.2 kg). At least, the chassis features good stability. It is just the vents on the bottom that yield noticeably under higher force. We would say that the build quality is good. 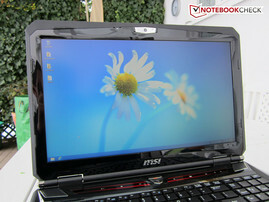 Apart from minor details (display bezel / lid transition), MSI has done a good job. 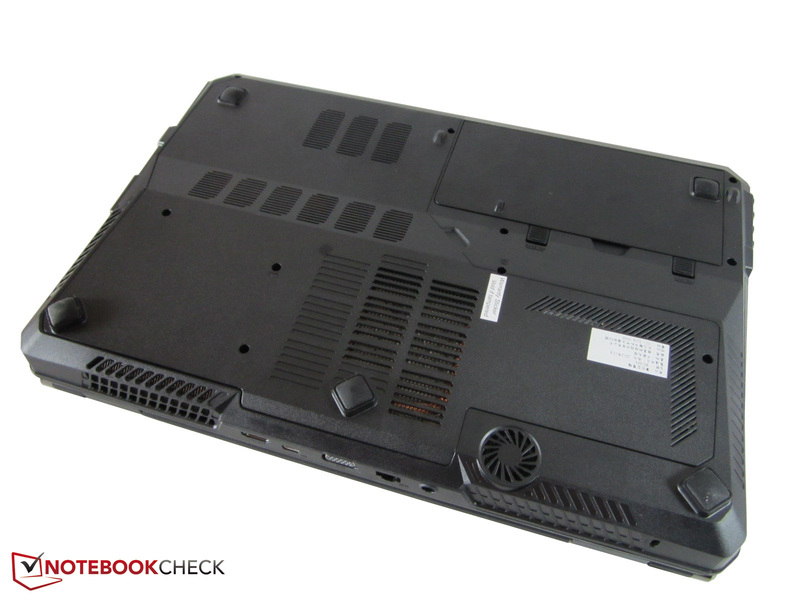 Unfortunately, the GX60 cannot compete with the quality standard of Asus' G75 or Alienware's M17x R4, but the latter devices are also much more expensive. The interfaces are largely identical with the 15-inch GT60 model. 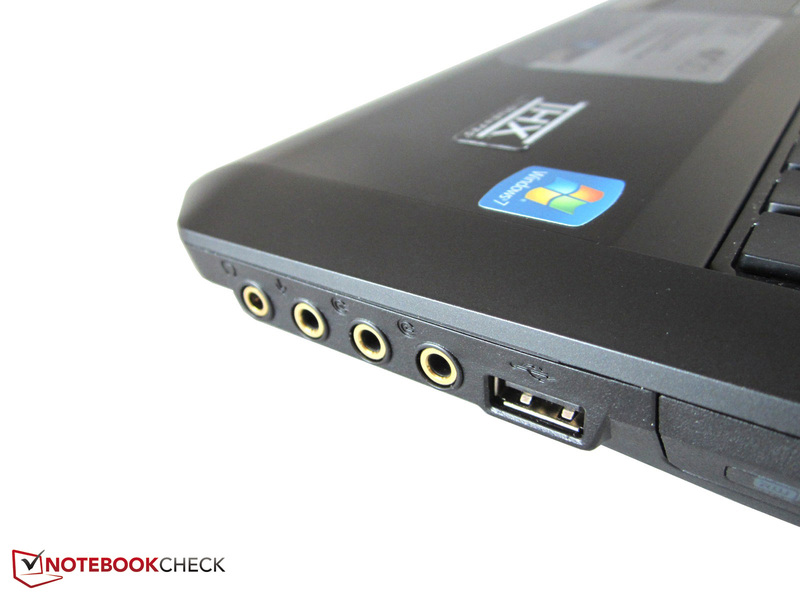 We not only have to praise MSI for the three USB 3.0 ports, but also for the four (allegedly gold-plated) audio jacks that transmit a 7.1 signal when the cords are connected correctly. Since a mini DisplayPort replaces eSATA, the desktop can boast with three video outs. 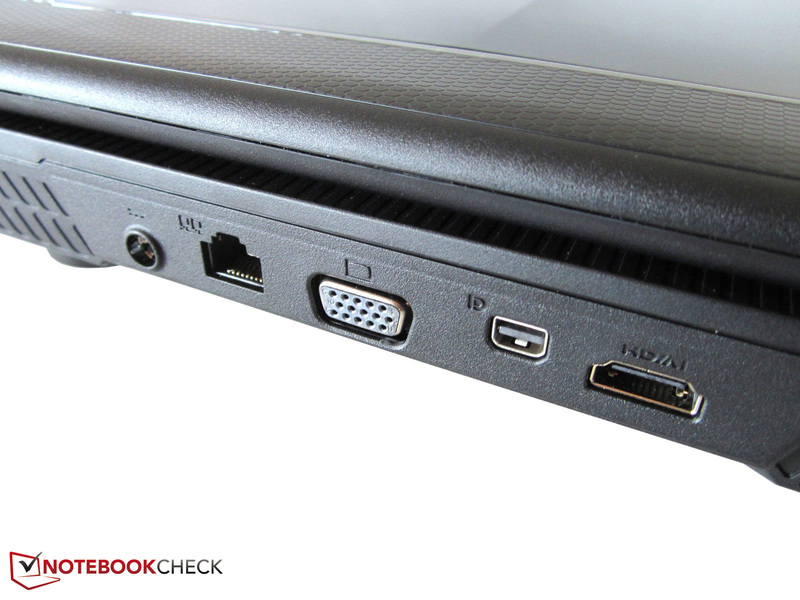 In addition to the DisplayPort, we find HDMI and VGA ports. A Kensington lock slot and RJ45 Gigabit LAN port are standard fare. 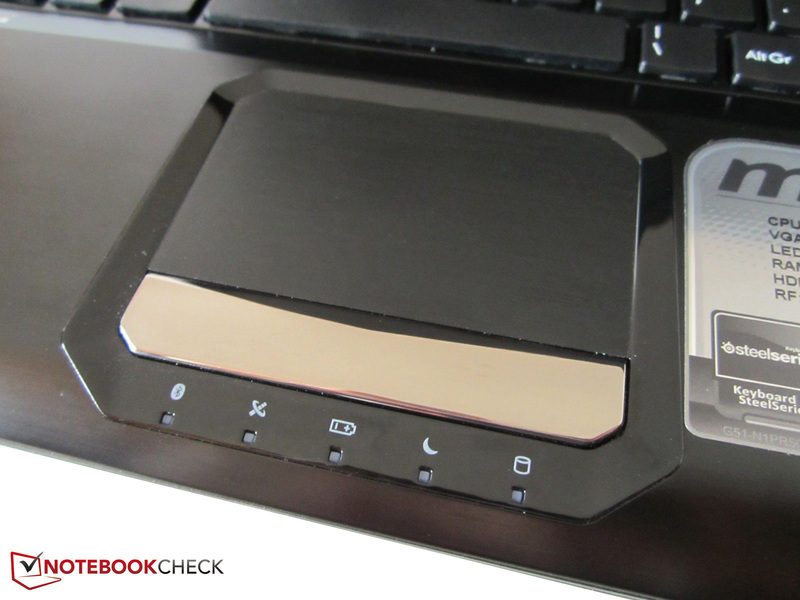 The built-in card reader supports SD, SDHC, SDXC and MMC formats. Summing it up, the connectivity is above-average. However, it lacks eSATA or a FireWire port and ExpressCard slot which could have got it a very good rating. Although the interfaces on the back are a bit inconvenient to use, most gamers will cope well with the port distribution. 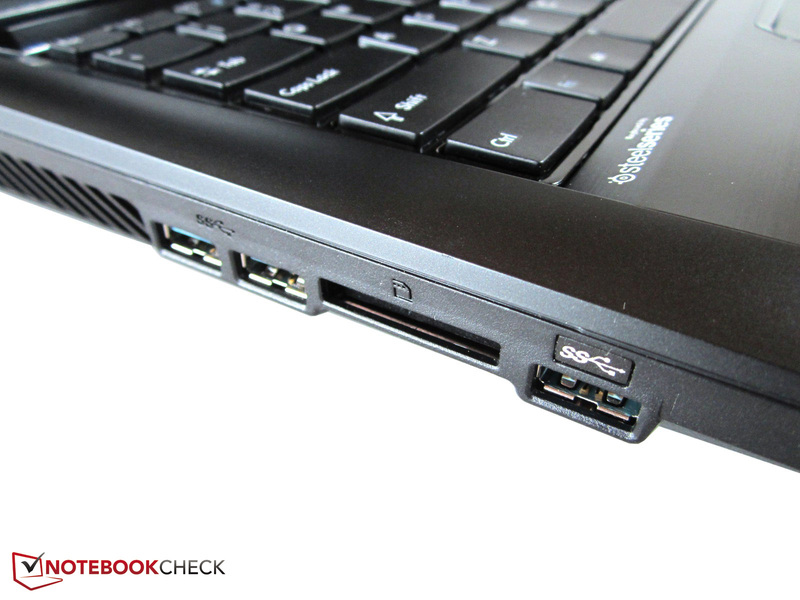 As appropriate for a modern laptop, the GX60 supports both the Wi-Fi 802.11 b/g/n standards and Bluetooth 4.0. The gaming-optimized Killer e2200 network card is complemented by nifty support software (Network Manager). Apart from the many screws, maintaining the GX60 is quite easy. All important components are accessible after removing the base plate. Among others, the RAM banks, the fan and hard disks (two 2.5 inch slots) can be reached. It is also theoretically possible to replace the graphics card and processor and it is noteworthy that both have a dedicated cooling construction. Damaging the warranty seal is not a major problem when remodeling is performed by an expert - at least not in Germany. Since a few of the praised programs were conspicuous by their absence (e.g. THX TruStudio Pro), we assume that the software bundle in our test configuration was not quite complete. As expected, MSI installs just as much bloatware on its devices as the competition. 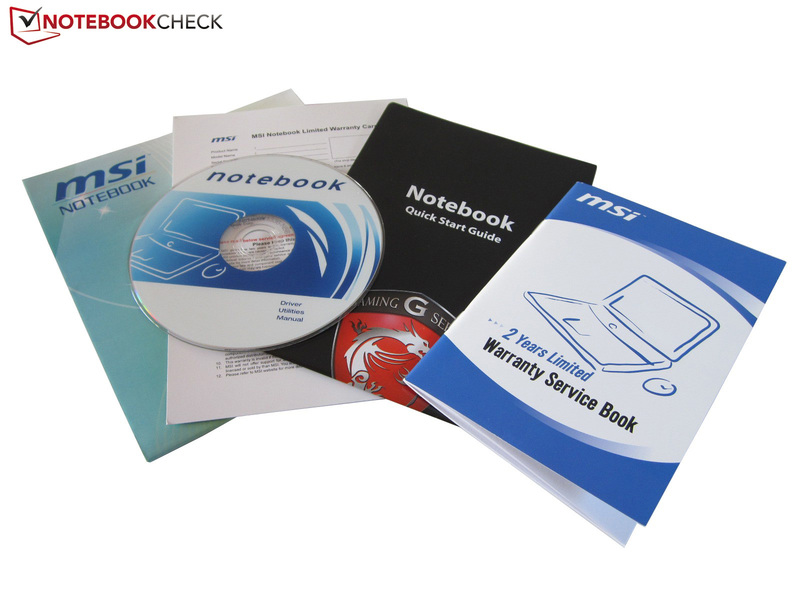 The cleanest operating systems are found on laptops from barebone resellers (Deviltech, One, Schenker, etc.). The included accessories for the US model are impressive. 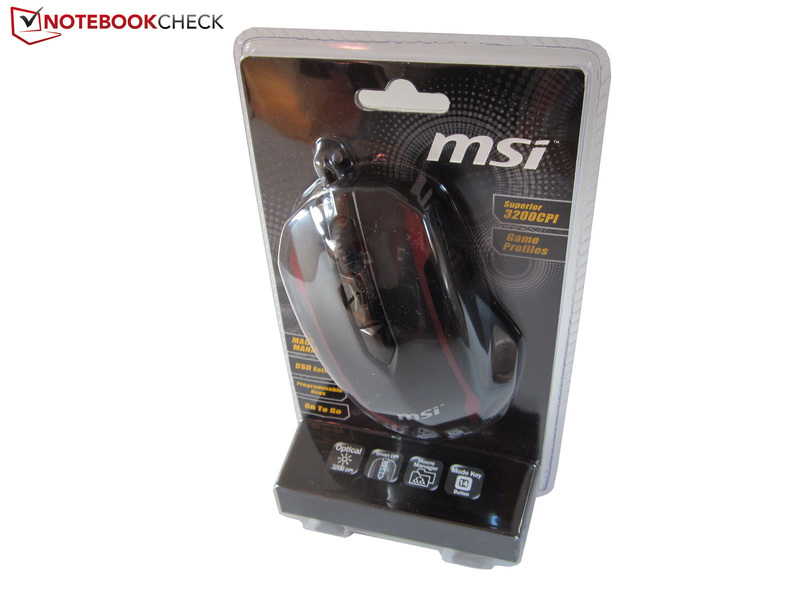 While a driver DVD, quick start guide, warranty card and warranty brochure are customary, the included gaming mouse (see right picture column) is an appreciated addition. The black-red mouse has an optical sensor with 3200 CPI and is capable of supporting features like macros and gaming profiles. 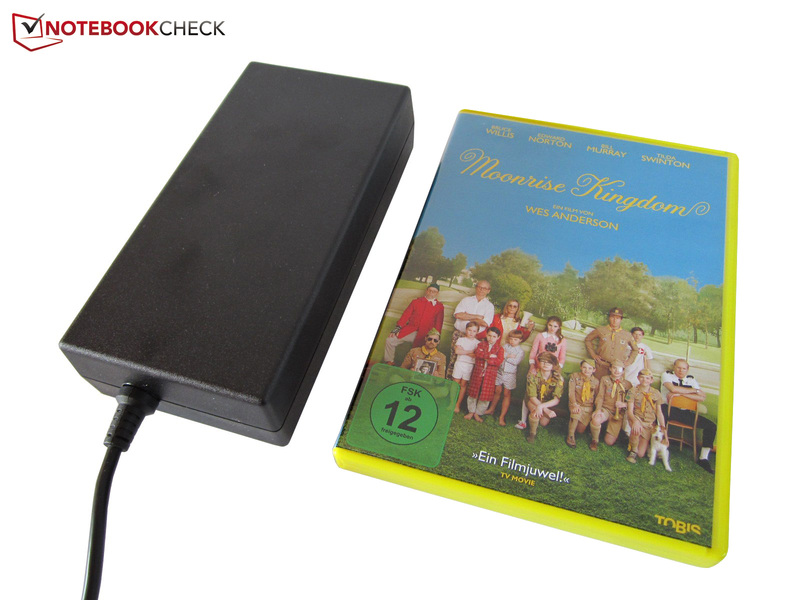 A thick 180 watts PSU (~850 grams) and a slim 9 cell battery (480 grams) are also part of the package. The casing slides easily without the battery. Typical for MSI, the warranty period is 24 months. 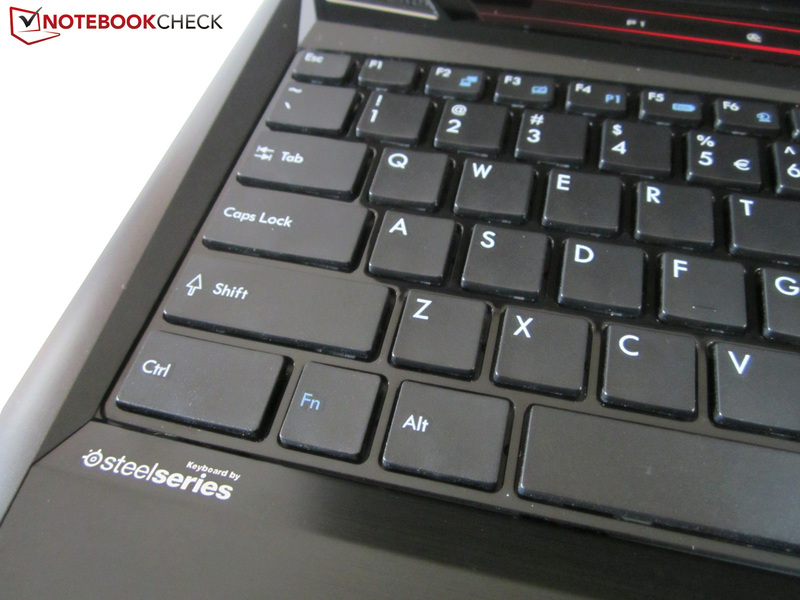 Despite the cooperation with SteelSeries, the keyboard is not a high-flyer. In addition to the lack of a backlight, the unusual layout will annoy a few users. Like in the GT60, the ‘>’, ‘<’, ‘|’ and ‘#’ keys are not where they usually belong. Beyond that, the German model only has a single-row enter key. Otherwise, the chiclet model is quite good. The rather angular, 14.5 x 14.5 millimeter keys exhibit a decent typing feel. The pressure point and stroke are very feasible owing to the hard base. The dedicated number pad is another bonus point. We were not quite happy about its sound. The keyboard generates a fairly loud and clattery noise depending on the typing vigorousness. 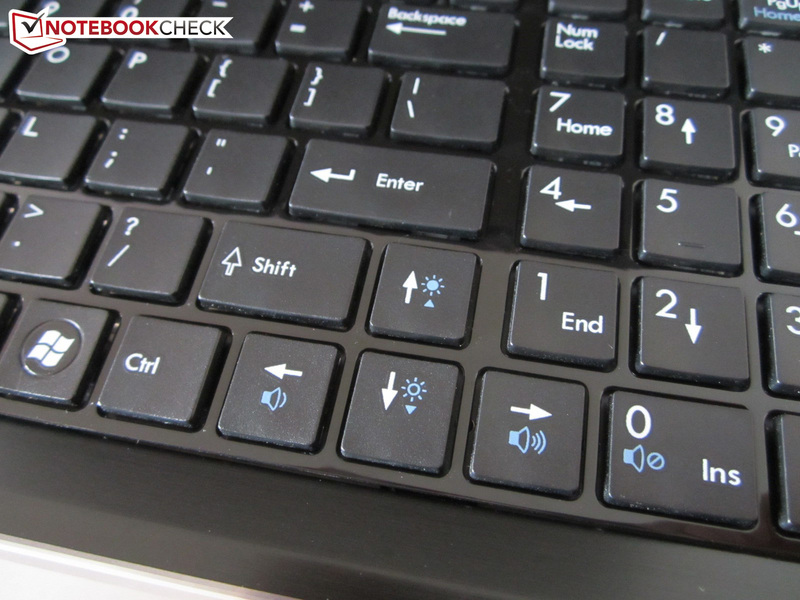 The picture below shows the US keyboard. 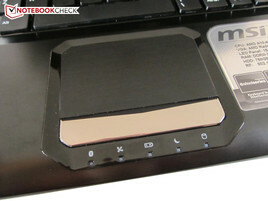 The recessed touchpad has the same look and texture as the wrist rest (brushed aluminum). The dark black surface of 7.7 x 4.6 centimeters is sufficiently sized, but a few additional millimeters would not have hurt. The multi-touch support has to be mentioned on the list of advantages this laptop has over its competition. Content can be scrolled, rotated and zoomed via two fingers as usual. The gliding characteristic and accuracy is middling in quality. MSI incorporates a deactivation function to prevent unintentional inputs during games. Both mouse keys, implemented as a single, continuous bar, featuring a rather high resistance to input and is something the user will need to get used to. Unsurprisingly, the 15.6-inch, non-glare screen uses an LED backlight. MSI does not experiment with the size. 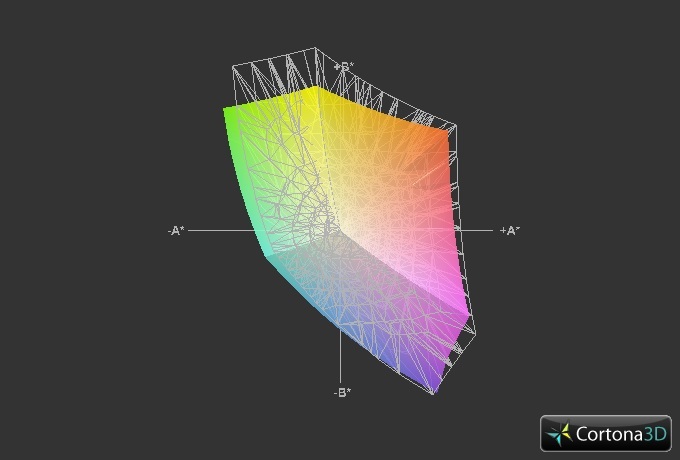 A 16:9 aspect ratio is the current standard. 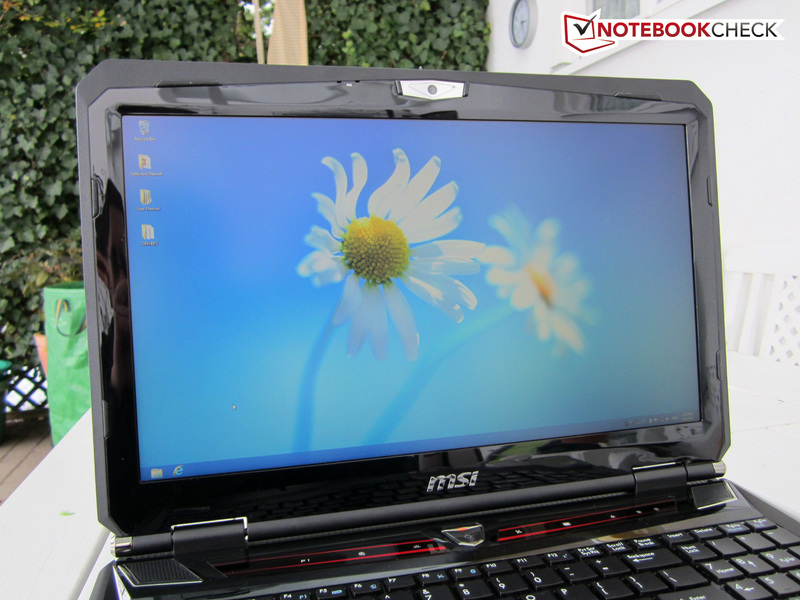 It is possible to work pleasantly with the laptop owing to the modern Full HD resolution of 1920 x 1080. Two adjacently opened windows are no problem. AIDA reveals the screen to be an LG Philips LP156WF1-TLF3. 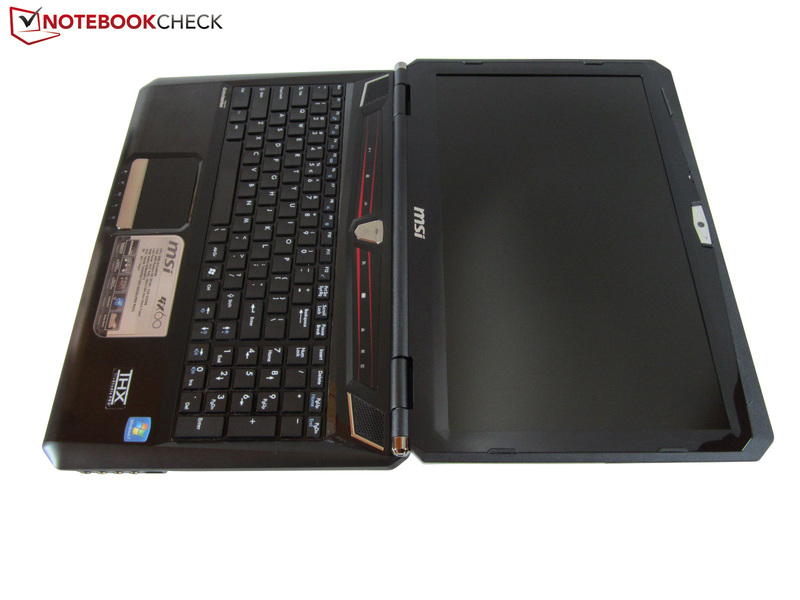 We have often seen this screen model in the past, like in Deviltech's Devil 6700, HP's EliteBook 8560w and Schenker's XMG A522. 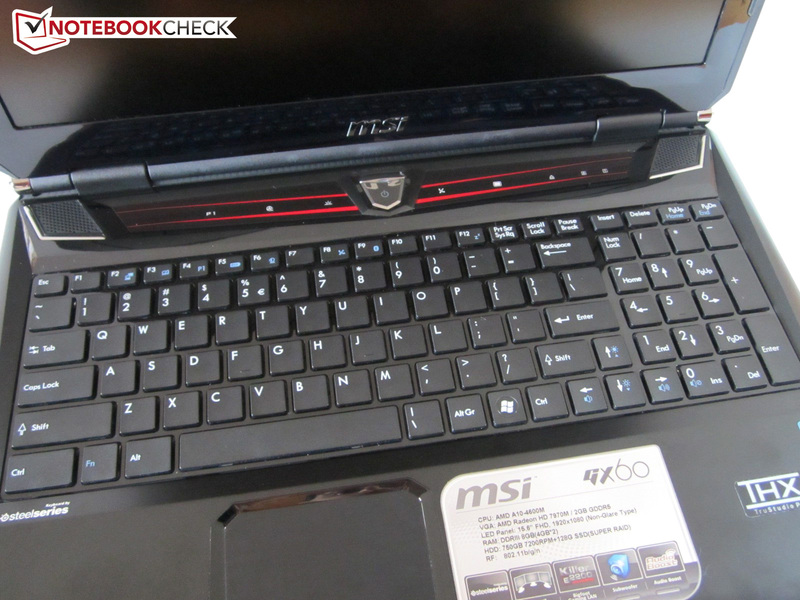 MSI sent us a second model after we discovered that the brightness could not be adjusted for unexplained reasons. Here, we ascertained a decent brightness. Nearly 225 cd/m² reading is enough even for light-flooded rooms. 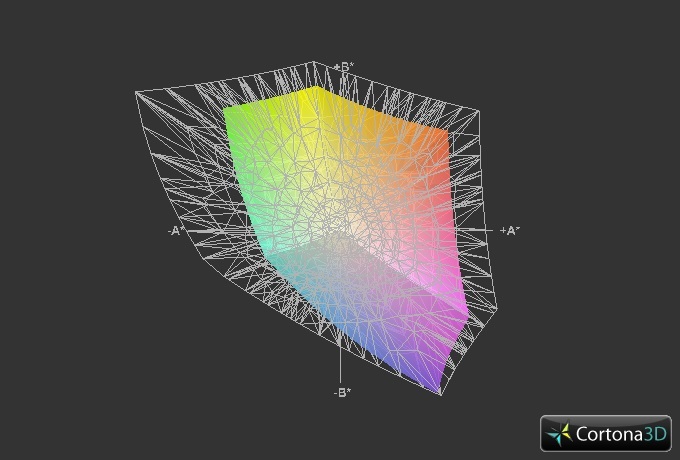 The black value of 0.4 cd/m² is also great. Dark game and movie scenes can be adequately enjoyed. This also results in a contrast of approximately 600:1 which is an excellent value. As can be seen in the lower screenshots, the LG Philips screen accomplishes good sRGB space coverage. The colors are exceptionally crisp for a non-glare screen. You will come to appreciate a matte screen surface outdoors at latest. The susceptibility for reflections is much lower than on a glare-type screen (e.g. Alienware's M17x R4 or Samsung's 700G7C). This also makes choosing a place rather secondary. One drawback of the AR coating is its somewhat paler colors. 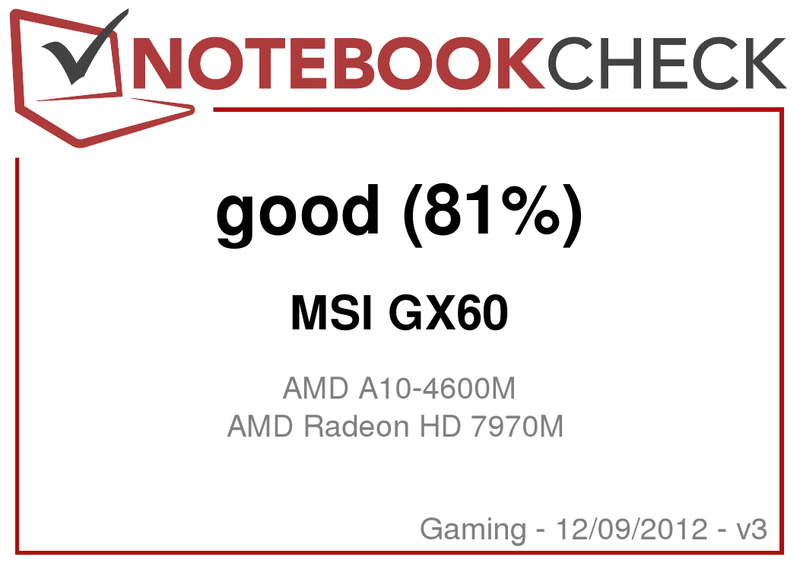 The Radeon HD 7970M is currently AMD's fastest laptop graphics card. Like its desktop counterpart, the high-end model is based on the GCN architecture manufactured in the 28 nm process. AMD tries to justify its high power consumption (100 watt TDP) with 2.8 billion transistors, 1280 Unified Shaders and 2GB of GDDR5 VRAM (256 bit interface). The manufacturer clocks the card at 850 MHz (core) and 1200 MHz (memory). Among others, the review of Alienware's M17x R4 underlines that the Radeon HD 7970M is a very good option for gamers. Alongside a strong Intel CPU, the graphics card can compete with the competition from Nvidia. The GeForce GTX 680M only wins in some games. Back to topic, MSI installs a cutting edge driver with the Catalyst 12.11. That is also very necessary because AMD's graphics switching (codename: Enduro) caused a lot of problems in the past. 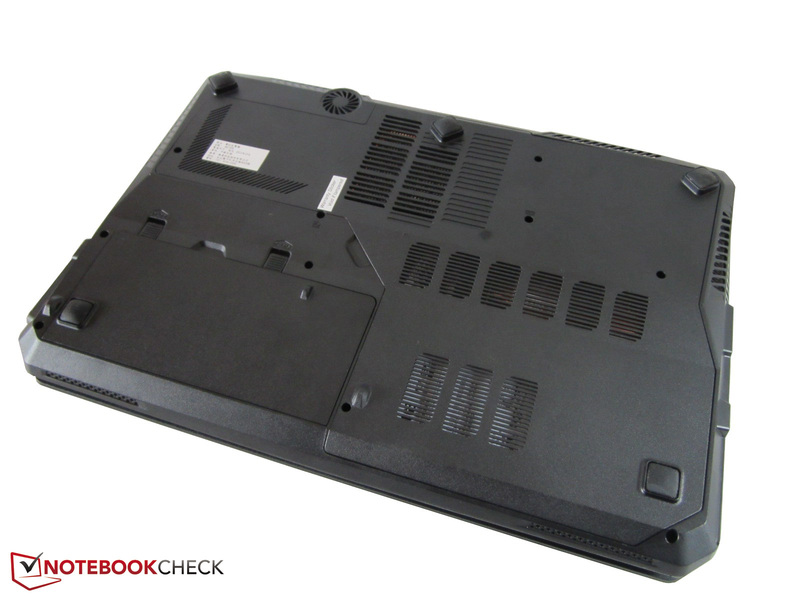 Lousy identification rates, modest performance in low settings, black screens after driver installation: The problems were multifarious particularly in the Clevo P150EM and P170EM barebones. Although Nvidia's Optimus technology still performs better (lower performance loss, higher reliability, more visible support), AMD has taken a big step forward with the Catalyst 12.11. Gamers no longer have to get annoyed about incorrectly assigned 3D programs since the driver features a global setting option (see right screenshot). 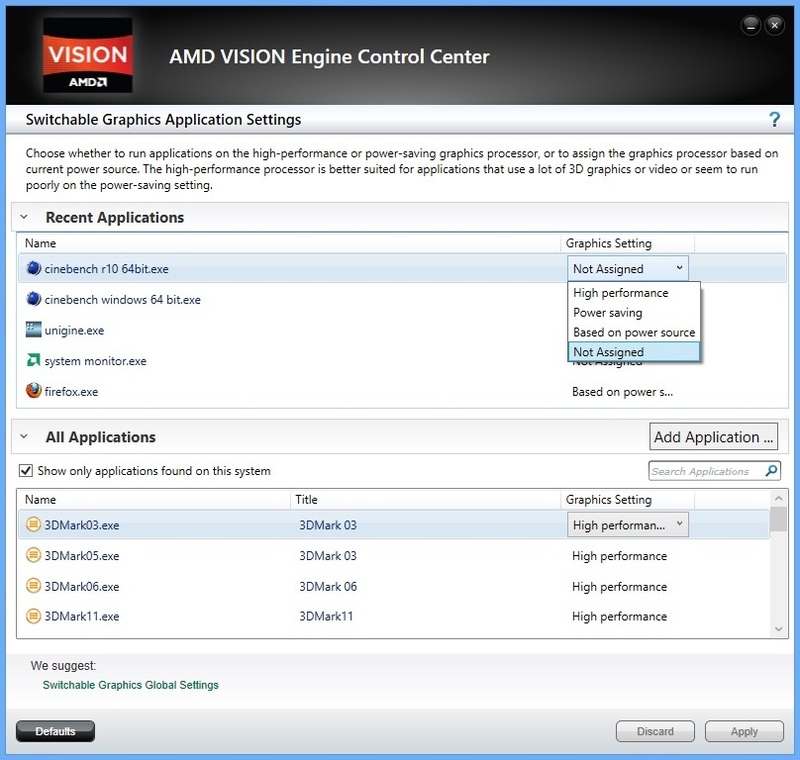 Games are reliably started with the Radeon HD 7970M when the option is set to "Maximize Performance". The menus is now perfect with the "Switchable Graphics Application Settings" now storing all installed and executed programs. 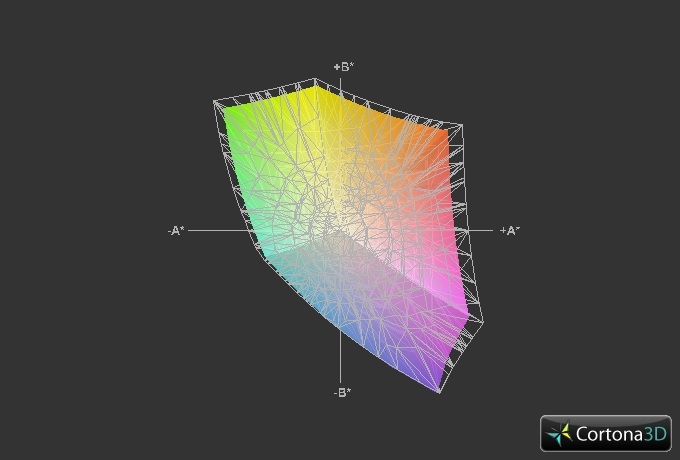 The user can create and modify profiles similar to Nvidia. "*.exe" files can be easily assigned to a specific graphics card. The menus of the first few drivers were still quite unsatisfactory. However, Enduro still lacks a convenient update function and an indicator for GPU activity (Nvidia has already had this for years). The GX 60 can be connected to as many as three monitors owing to Eyefinity technology. AMD's weak processor does not have much significance in extremely graphics-heavy applications, such as 3DMark 11. With a GPU score of 6423 points, the GX60 overtakes Deviltech's Devil 6700 by about 8%. 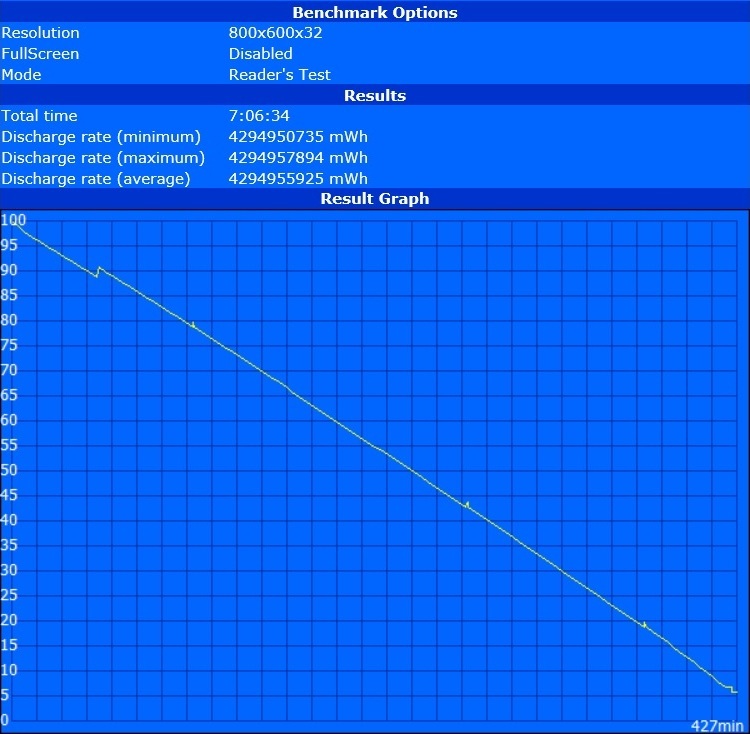 Its GeForce GTX 680M accomplished 5947 points in this test (slightly older driver). That sounds like an excellent performance, doesn't it? It is as long as only the GPU scores are considered. The overall score is often dismayingly low. 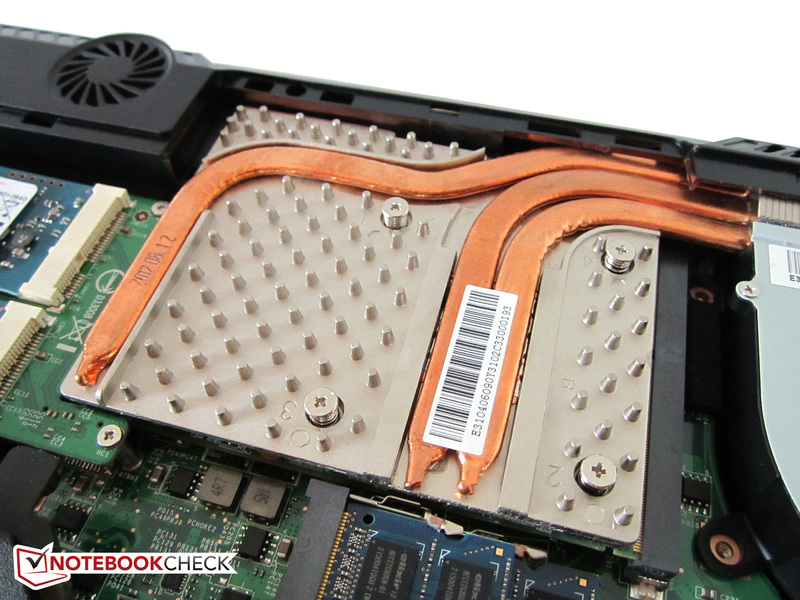 HD 7970M laptops equipped with an Intel CPU reach approximately 100% higher scores in 3DMark 05, 06 and Vantage. The GX60 exhibits a good performance again in the Unigine Heaven 3.0 benchmark. The laptop rendered 57.7 fps using 1920 x 1080 pixels, high details and default tessellation. The GTX 680M in Schenker's XMG P502 recently accomplished 57.6 fps. 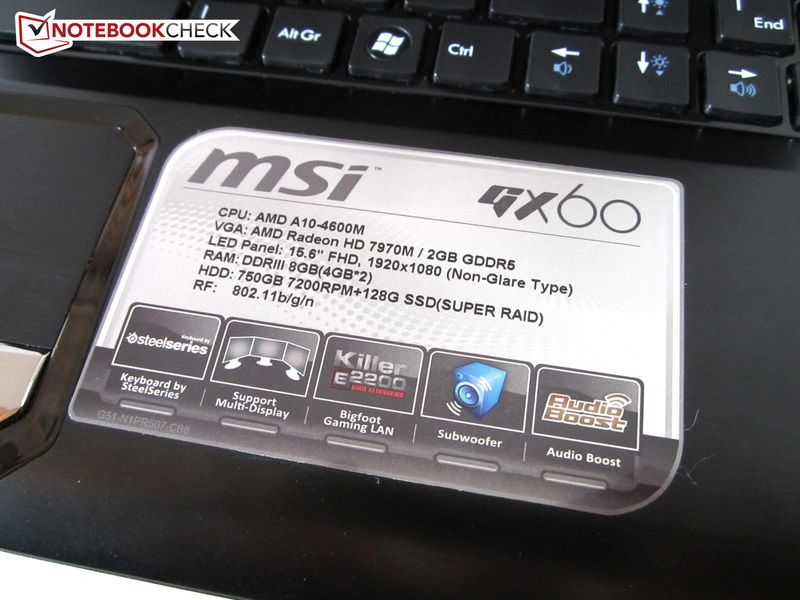 Last but not least, MSI touts the GX60 with a promising RAID 0 array. 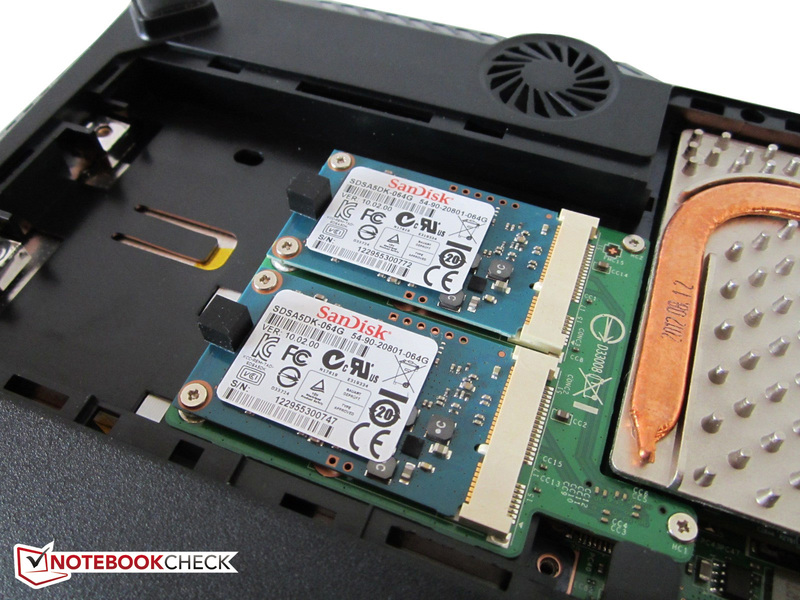 Both the small 64 GB mSATA SSDs from SanDisk easily defeat the competition. 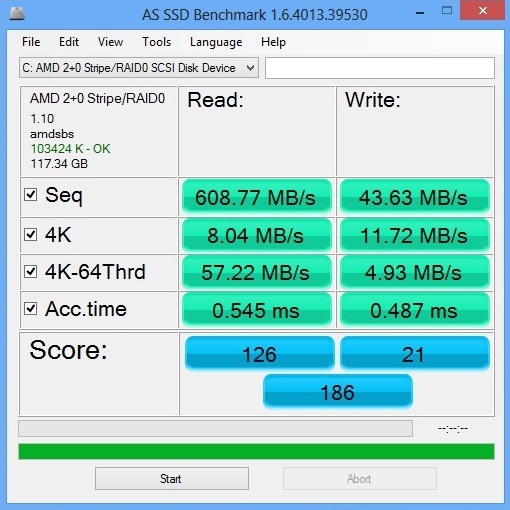 Looking at the sequential read rate, which is over 600 MB/s in the AS SSD benchmark is out of reach for most SATA III models. Even the 512 GB version of the extremely swift Corsair Neutron GTX (Schenker's XMG P722 PRO) has to be satisfied with results of about 514 MB/s. However, as soon as focus is put on smaller files, the exultation quickly vanishes. 8 MB/s in the 4K test and 57 MB/s in the 4K-64Thrd test are rather moderate for SSD conditions. The 128 GB model of Samsung's successful SSD 830 is 2.5 times better in 4K with 21 MB/s and 5 times better in 4K-64Thrd with 291 MB/s. The big shock comes first in the write rates though. With a sequential rate of not even 44 MB/s, the RAID 0 array drops below the average HDD level (CrystalDiskMark still recorded 88 MB/s). For comparison: Both mSATA members accomplished a 9x better 391 MB/s in the GT70. The distance to the SSD competition is also gigantic with smaller files. Most solid state drives can only smile wearily at a 4K rate of 12 MB/s and a 4K-64Thrd rate of 5 MB/s. The somewhat older but still popular Crucial Read SSD M4, for example, settles to 50 and 158 MB/s respectively (128 version @ Gigabyte's U2442N). Basically, we do not deem the RAID 0 array a good idea. A "conventional" 2.5 model would make a subjectively better impression in practice. 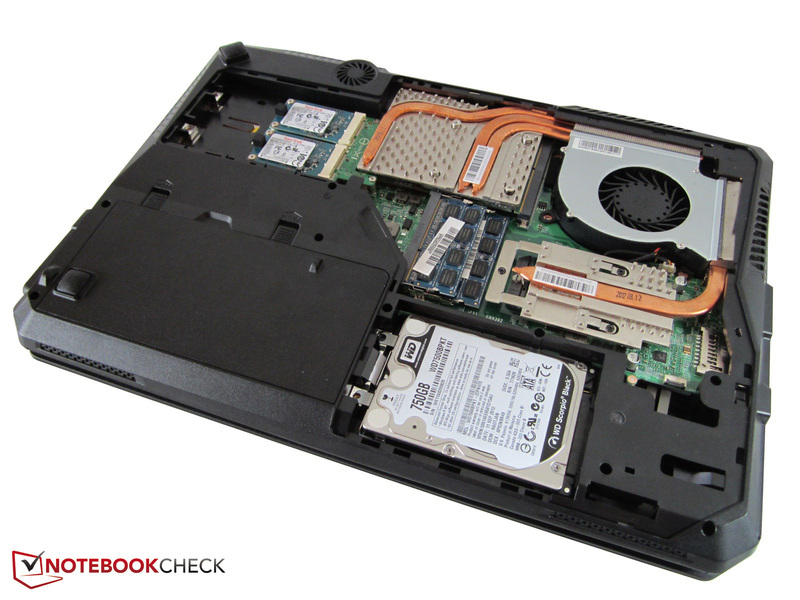 But the GX60 also sports a 750 GB HDD besides the solid state drives. 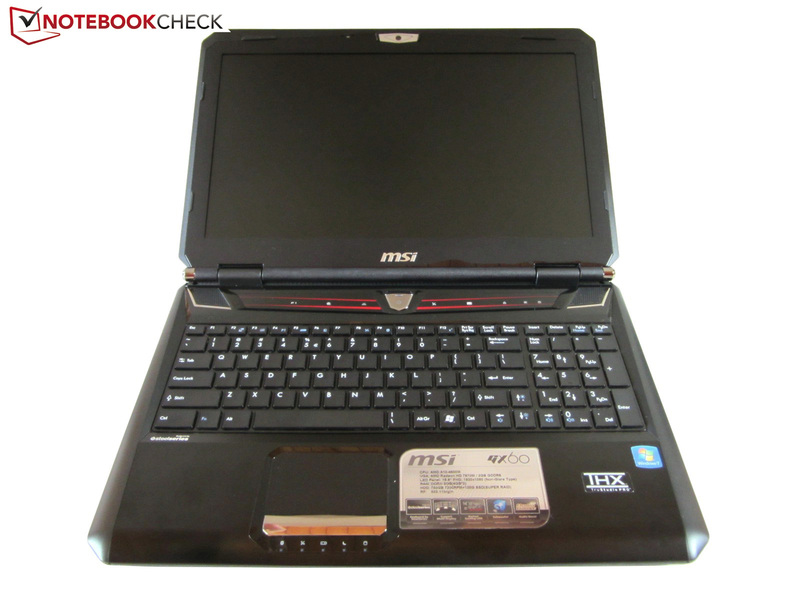 MSI relies on a product from Western Digital dubbed the WC75000BPKT-22PK4. CrystalDiskMark certifies the SATA II drive to have very good performance. Only few HDDs surpass 114-115 MB/s in the sequential benchmark. The drawback of a 7200 rpm drive is the fairly loud operating noise. Since PCMark Vantage does not supply an overall score under Windows 8, we were limited to PCMark 7. The result will unlikely knock anyone's socks off. 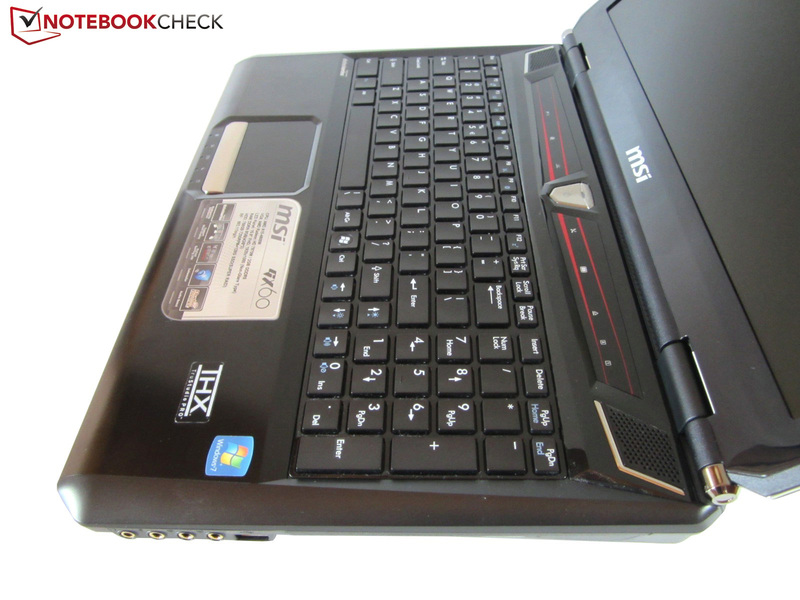 With 3174 points, the GX60 places itself between the multimedia laptops Dell Inspiron 14z-5423 (3102 points @ Core i5-3317U + Radeon HD 7570M) and the Samsung 700Z7C-S01DE (3281 points @ Core i7-3615QM + GeForce GT 650M). "Genuine" premium laptops end up in the 4000 - 5000 range. 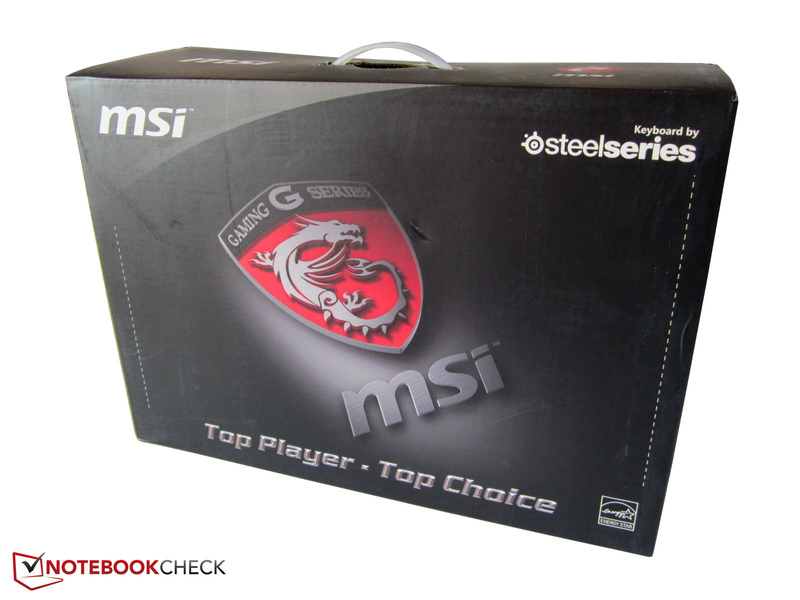 When looking at the gaming results, we wonder whether MSI tested the hardware combination thoroughly in advance. Although the GX60 could sometimes outperform Intel devices equipped with a GeForce GTX 670MX or GTX 675MX, in extreme conditions (1920 x1080, maximum details), the Radeon HD 7970M often dropped to the level of the weaker GeForce GT 650M or GTX 660M in medium settings (1366 x 768, high details). In the worst case, the refresh rate was only just above the processor-integrated Radeon HD 7660G chip. CPU-heavy tracks, such as Guild Wars 2, Need for Speed: Most Wanted, Hitman Absolution and Assassin's Creed III can only be played with restrictions if at all. It is surprising to what extent the slow Trinity CPU affects the Radeon HD 7970M performance. 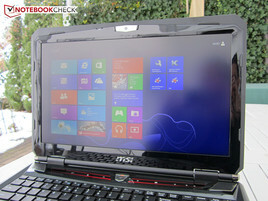 The GX60 would likely score much higher with a low-end dual-core processor from Intel's Core i3 or Core i5 range. The HD 7970M is normally comparable with a GeForce GTX 680M. After extensively studying the benchmarks, the retail price no longer seems particularly attractive. 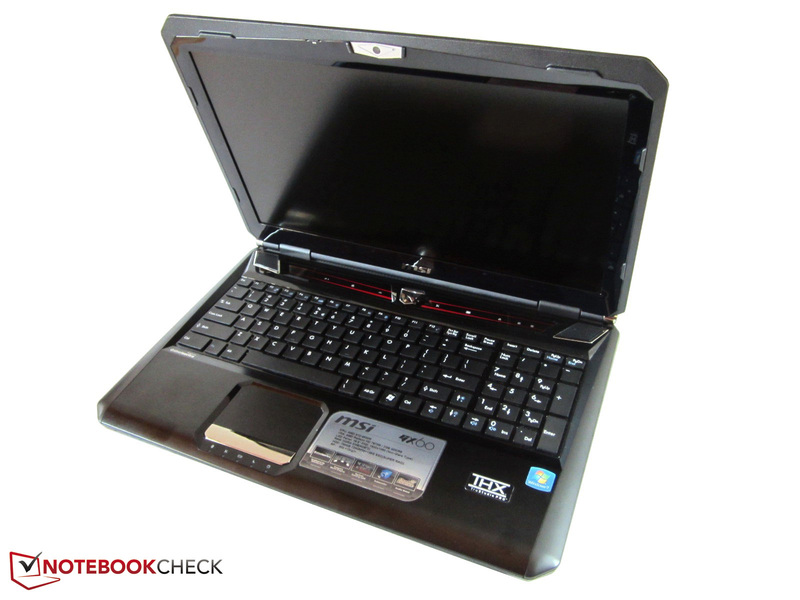 Less expensive laptops, such as Schenker's XMG A522 often accomplish a comparable gaming performance. MSI should have invested its budget in a faster CPU. The Radeon HD 7970M can only rarely exploit its true potential. A detailed benchmark list can be found below this article. Although the GX60 only sports one fan, the cooling system can easily compete with the Clevo P150EM and P170EM barebones. An average of 42 dB in the first 3DMark 06 scenario and 52 dB during full load are absolutely normal for a gaming laptop. Schenker's XMG P702 reaches 46 - 54 dB when using the Radeon HD 7970M. The noise level did not quite convince us during idle use. On the one hand, the base noise of ~35 dB was already very audible. On the other, the fan's speed occasionally increased to a somewhat disconcerting 38 dB. Our meter only recorded 33 - 35 dB in Schenker's XMG P702. 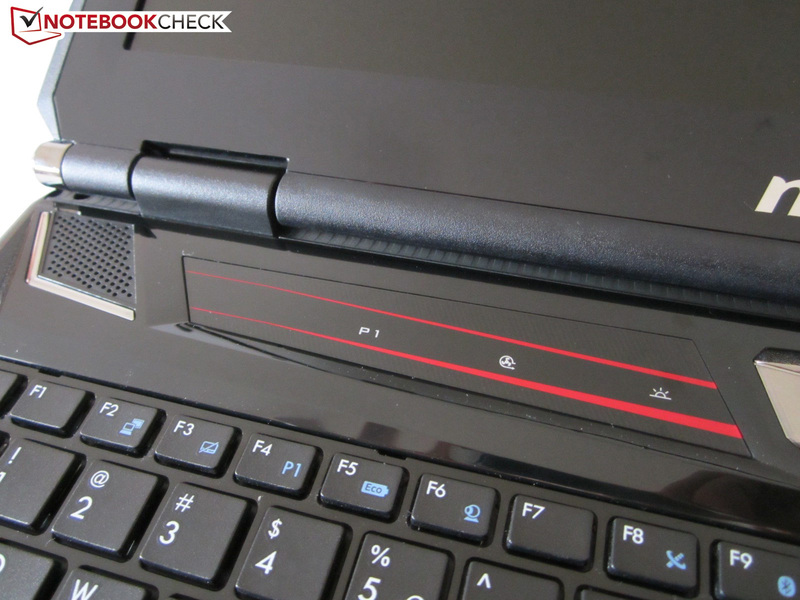 We again recommend Asus' G75 for noise-sensitive gamers. One of the GX60's biggest strengths is its moderate temperature development. Owing to the casing's clever build, the wrist rest never exceeds a temperature of 30°C even during demanding 3D programs. The chassis settled to decent 26°C in idle mode. The temperatures were also absolutely reasonable during load. The laptop only reached just below 40°C at the vent. The user does not have to worry about the hardware, either. 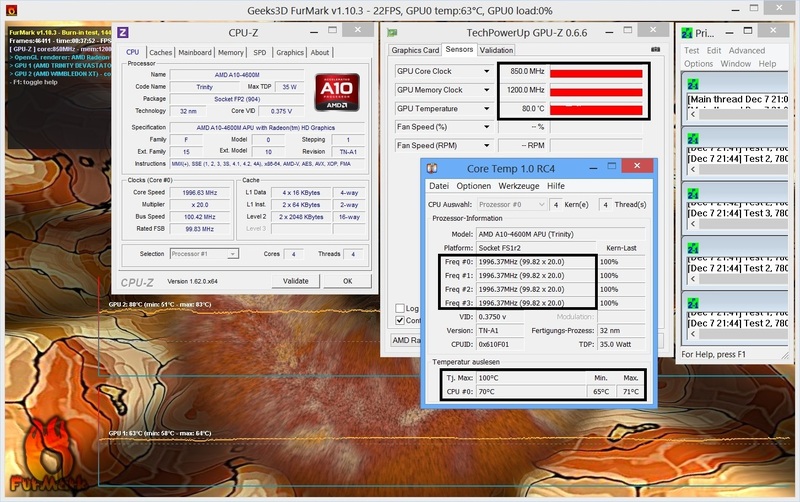 The graphics card "only" reached 80°C after one hour of stress testing. The processor climbed to an acceptable 70°C according to Core Temp, but the clock rate occasionally dropped below two GHz (throttling). Note: Our first test device crashed repeatedly in the stress test. (+) The average temperature for the upper side under maximal load is 30.3 °C / 87 F, compared to the average of 32.9 °C / 91 F for the devices in the class Gaming. (+) The maximum temperature on the upper side is 38 °C / 100 F, compared to the average of 39.3 °C / 103 F, ranging from 21.6 to 68.8 °C for the class Gaming. (+) The average temperature of the palmrest area of similar devices was 28.7 °C / 83.7 F (+2.3 °C / 4.2 F). MSI has done a great job with the sound. The GX60 sports a 2.1 system that is comprised of two speakers and a subwoofer. The sound is amazingly clear and rich for laptop conditions. In contrast to other devices, the bass is very audible. The THX support and the good maximum volume also have to be praised. In short, only a fraction of the competition can compete with the sound quality of the GX60. 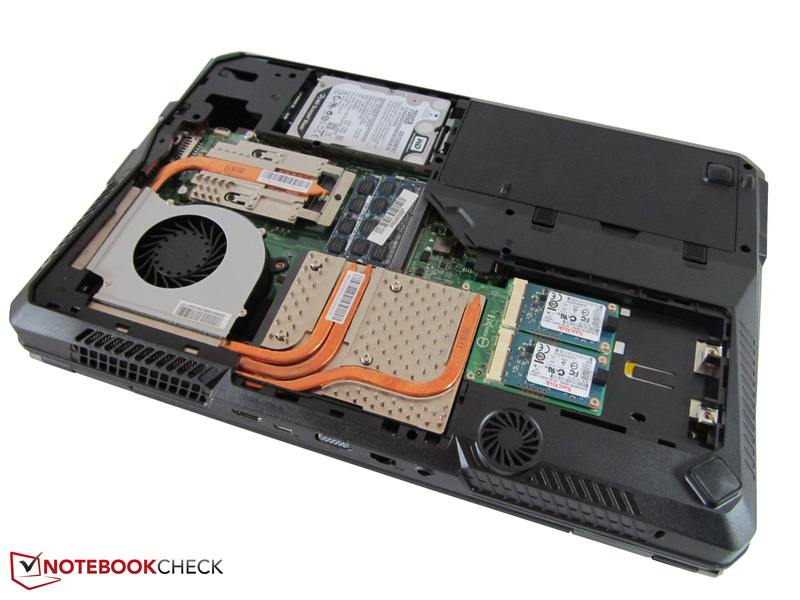 Even Alienware's M17x R4 and Asus' N56VZ/N76VZ have a hard time competing against the 15-incher. 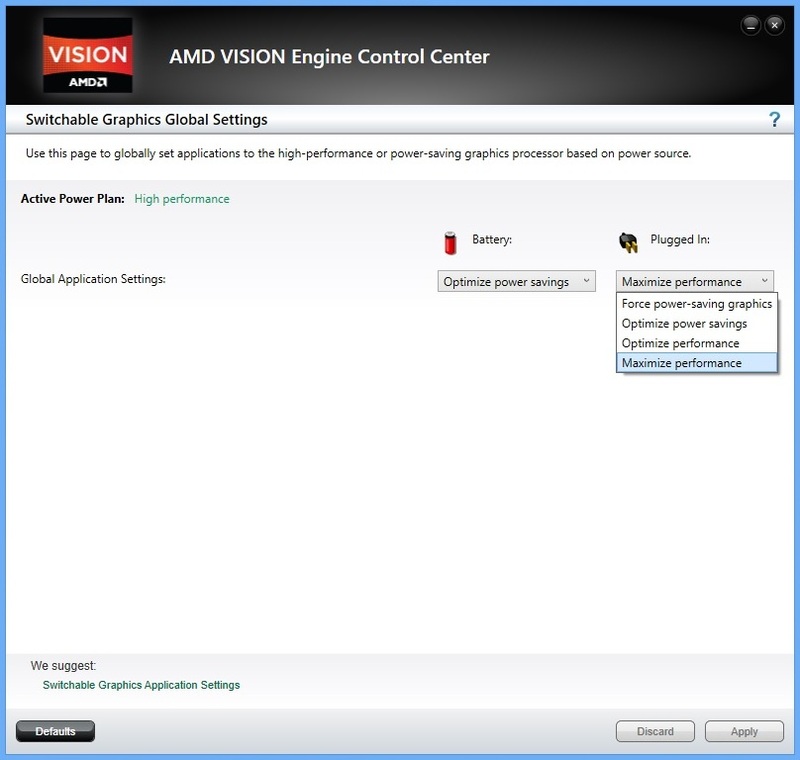 The power consumption is within limits when the Radeon HD 7660G is primarily active in idle use. 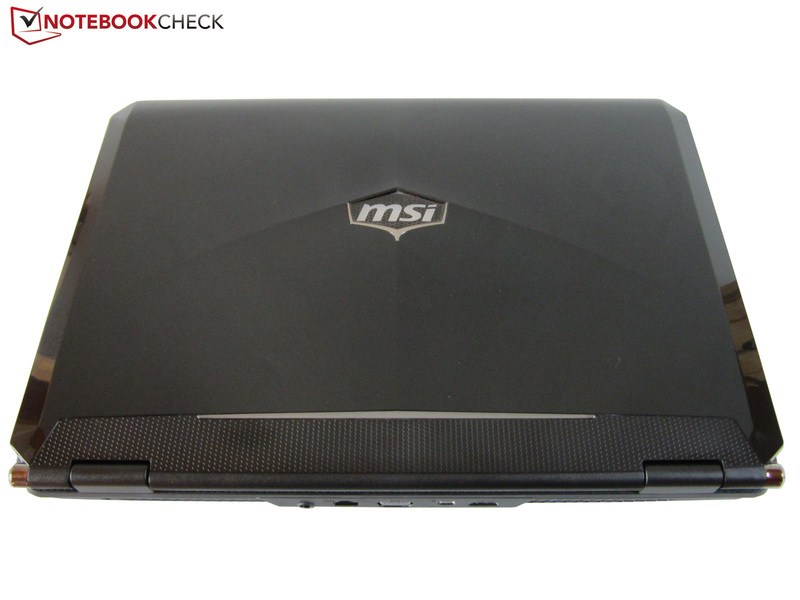 With 13-24 watts, the MSI laptop consumes roughly the same power as Deviltech's GTX 680M contender Devil 6700 (16-22 watts). The GX60 is a bit more energy-efficient during load (85-138 vs. 100-149 watts). The strong, 87 Wh lithium ion battery accomplishes good to very good runtimes. 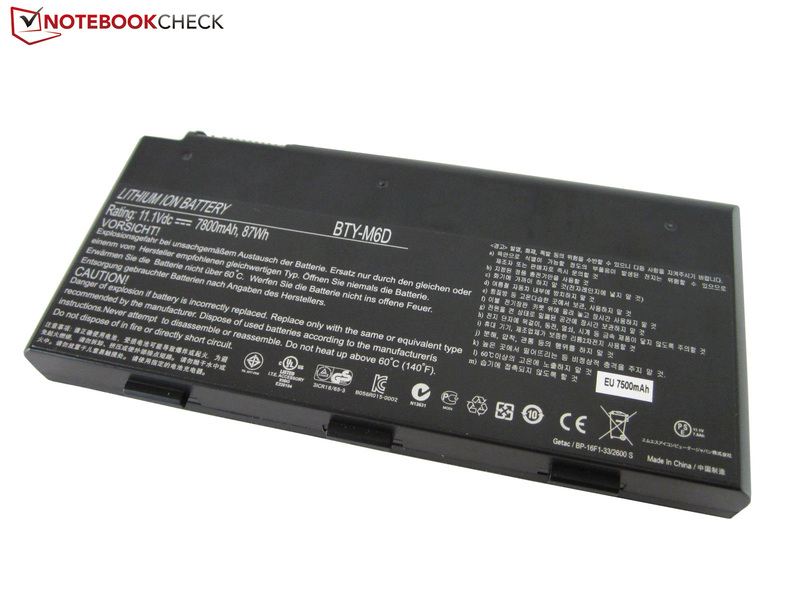 The 15-inch laptop lasts for around seven hours without the power outlet in ideal conditions (minimum screen brightness, low load). We always perform our Wi-Fi test with a brightness of approximately 150 cd/m². This resulted in almost five hours of wireless Internet entertainment. A DVD ran for roughly 3.25 hours in maximum brightness. We ascertained a minimum runtime of around one hour. All said, we regrettably cannot recommend the GX60 as a gaming machine for the enthusiast (on a budget). As our benchmark course illustrates, the lame AMD CPU affects the performance of the Radeon HD 7970M greatly in some gaming tests. 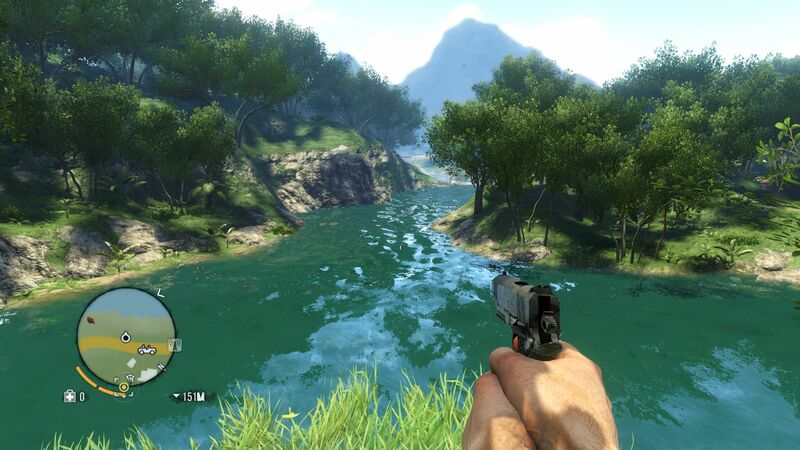 The performance loss is so high in some areas that the frame rate drops to a that of a middle-level GPU. We would have expected a more sensible hardware setup from an alleged gaming expert. The surprisingly low price is no argument. The 15-inch Clevo P150EM barebone is available for approximately 1300 Euros ( $1700) with an Intel quad-core and a Radeon HD 7970M. Its advantage is more consistent performance without nasty outliers. 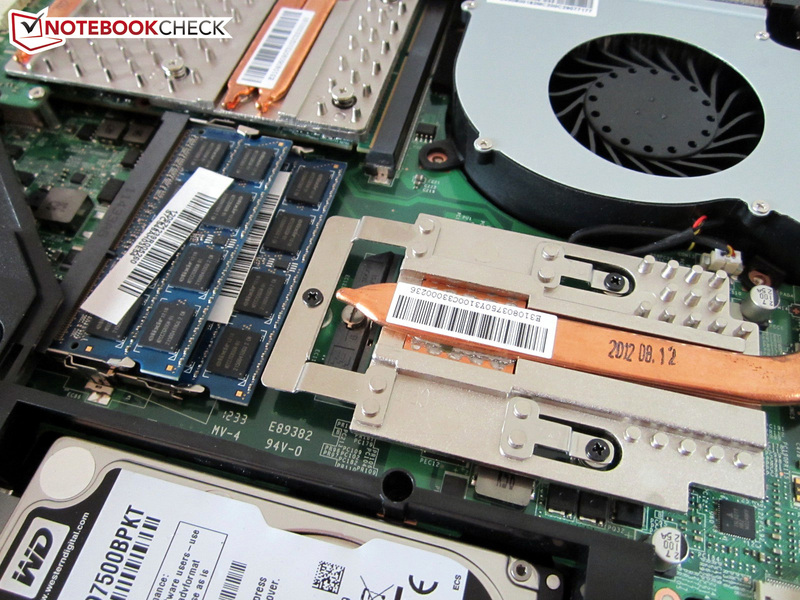 Both mSATA SSDs are also a double-edged sword. The excellent sequential read rate contrasts the poor performance in small files. In addition to that, there is the unusual keyboard layout and casing's sensitive surfaces. But that is enough complaining because the GX60 also has its good sides. Besides the generous connectivity and low temperature development, we have to mention the excellent TN screen. 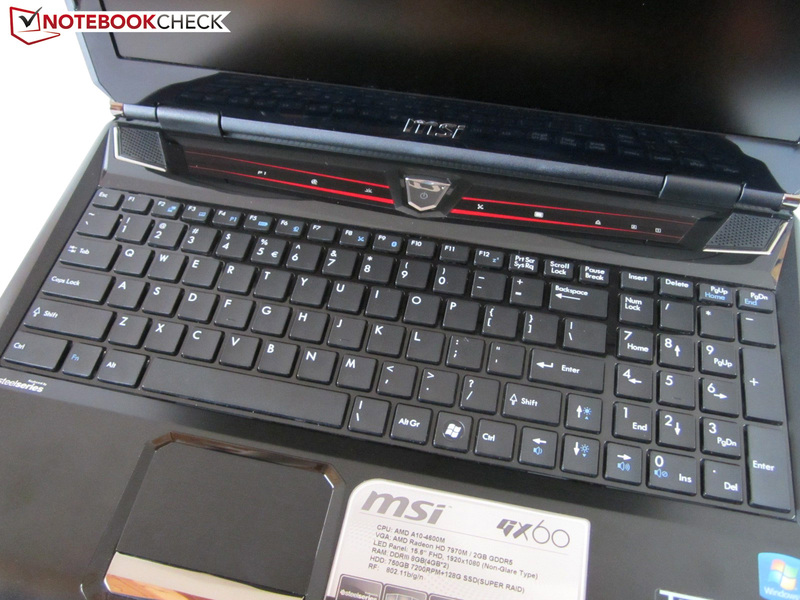 MSI has put particular focus on the sound. The built-in 2.1 system clearly excels over most other laptops. Nevertheless, it is not easy to come to a final verdict. The GX60 is designed for casual gamers considering the CPU issue. Enthusiasts will have to look elsewhere with something containing ‘Intel’. The sensitive lid conveys a cheap plastic charm. The integrated HDD is a lot of storage space. 87 Wh capacity is above-average. According to the spec sheet, the webcam supports 30 fps of video. 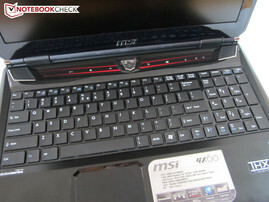 MSI tries various new things with the keyboard. Allegedly, SteelSeries was involved in its development. The fan button (center) ensures better cooling. The handy function bar does not always respond ideally. Brightness and volume can be controlled conveniently. Up to three monitors can be connected to the GX60. Five status LEDs are located below the touchpad. The audio jacks can transmit a 7.1 signal when desired. A mini DisplayPort is rare. The card reader is surrounded by three USB 3.0 ports. Several info leaflets are in the box. The 180 watt PSU is quite large. Our test laptop included a chic gaming mouse. AMD's processor quickly finds its limits. The Radeon HD 7970M doesn't heat up much even when doing a 3D operation. The US model includes two small 64 GB mSATA SSDs. The design and material mix are unusual. Fingerprints gather quickly on the surfaces. We would call the looks flashy. The big maintenance cover is secured with several screws. 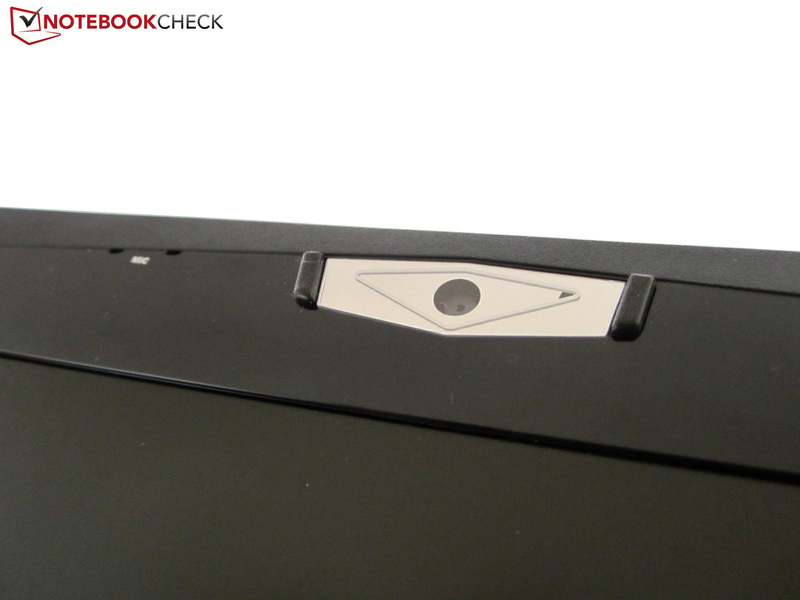 The laptop has a height of almost 55 millimeters when closed. Kudos: The maximum opening angle is 180°. A few interfaces are located at the rear. The GX60 scores with good equipment. 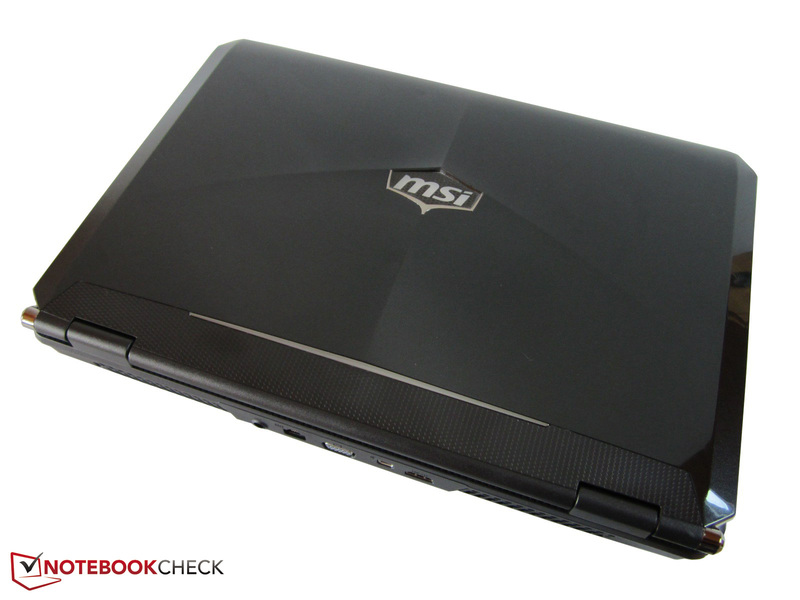 The MSI logo lights up when in use. The glossy display bezel is highly reflective. The interior makes a neat impression. 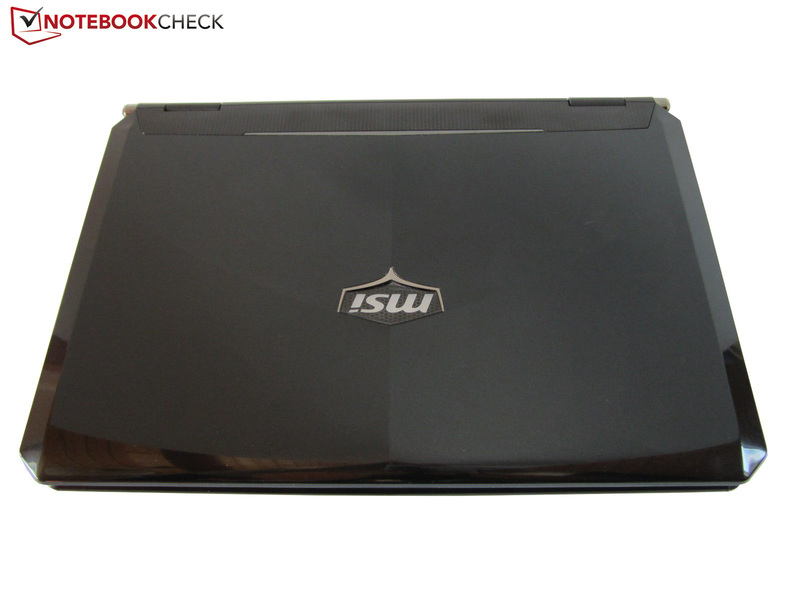 The 15-incher weighs over 3.4 kilograms with the battery. The wrist rest is made of brushed aluminum. Windows 8 is installed as the operating system of choice. The casing's bottom sports a small subwoofer. The battery (lower left) features a rubber foot. MSI want to particularly attract gamers with its product. Above all, the good picture and sound quality. A plain design and matte casing surfaces. The processor has a surprisingly high influence on the gaming performance. 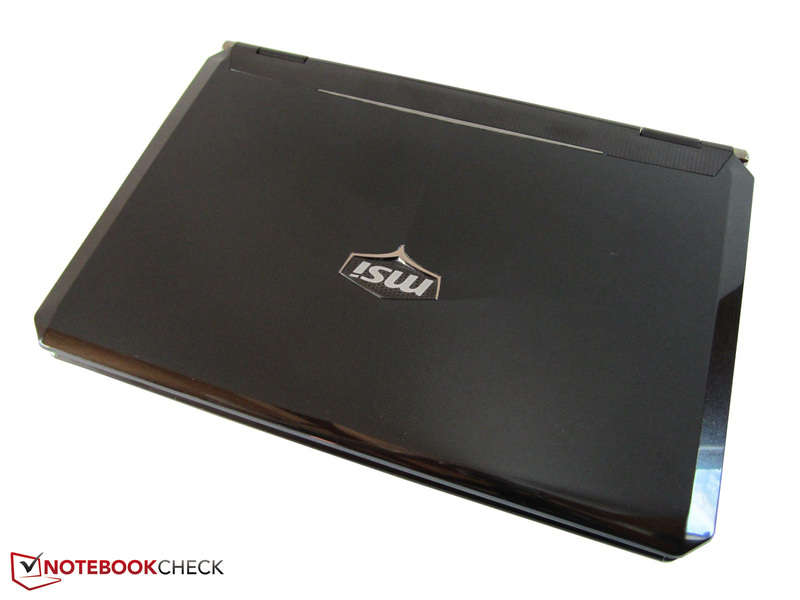 15-inch high-end laptops such as the Asus G55, the Deviltech Devil 6700, the Schenker XMG A522 or the Schenker XMG P502.